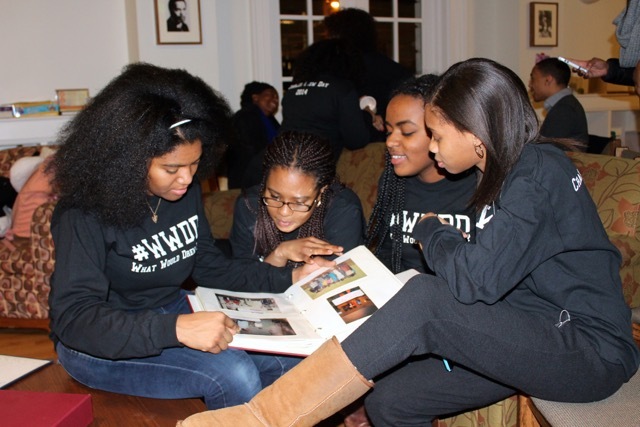 Drew House residents look through scrapbooks depicting black culture events held by the house in the past. This activity was a part of Drew House Hot Chocolate Hour on Charles Drew Day last Thursday. Residents of Charles Drew House held the college’s first ever Charles Drew Day on Thursday, Dec. 4 to honor Charles Drew ’26, an alumnus who is notable for being a black member and pioneer of the medical profession. “Charles Drew Day is meant to celebrate the life and accomplishments of Dr. Charles Drew in the face of adversity. We hope to spread awareness of his life’s mission, how it relates to Charles Drew House, and why his life matters to us today,” said Bessie Birhanu ’17, Resident Counselor of Drew House. Birhanu, Tatiana Hill ’16 and Matt Randolph ’16 were the main event organizers. “We reached out to the Charles Drew Health Professions Society, the Multicultural Resource Center, and Dean Brown in Student Life for support in planning and organizing Charles Drew Day,” Randolph said. In the first event, organizers tabled in Keefe Artium to hand out Drew Day buttons and held an educational trivia game through which students entered a raffle for T-shirts. Archives and Special Collections gathered archival material on Drew’s life and opened a display in Frost Library through the afternoon. The day concluded with Drew House Hot Chocolate Hour, which took place in Drew House’s common room. During the event, participants flipped through scrapbooks made by former residents and watched a historical video about Charles Drew. The event was “meant to be an open forum of discourse on Drew — the man and the house — especially for people who may not know a lot about either,” Birhanu said. The organizers followed up Hot Chocolate Hour with a discussion on the connection between Charles Drew’s legacy and the goals of Drew House today. Charles Drew was born in 1905 to a middle-class black family in Washington, D.C. He was accepted to Amherst on an athletic scholarship, and enjoyed a successful academic and athletic career at the college. He went on to earn his Doctor of Medicine and Master of Surgery degrees at McGill University and a Doctor of Medical Science degree from Columbia University. While at Columbia, Drew pioneered groundbreaking, internationally-renowned research on blood transfusions and created the modern blood bank. Drew discovered that storing red blood cells and blood plasma separately greatly prolonged the viability of each for blood transfusions, and that plasma transfusions are possible even between people of different blood types. Drew became the first black person to be appointed an examiner by the American Board of Surgery. He also became the supervisor of the Blood Transfusion Association for New York City, project director for the American Red Cross, head of the Department of Surgery at Howard University, and medical director of Freedmen’s Hospital. Despite Drew’s successes, his career was also fraught with clashes against institutional racism. He resigned from his position at the American Red Cross after the United States War Department issued a directive ordering that blood donations from white people be separated from those of blacks. Drew’s career at academic institutions also involved extensive work on equalizing education and the medical profession for black Americans — a legacy that was emphasized by the organizers of Charles Drew Day. Birhanu said she hoped that Charles Drew Day would be a tradition for many years to come. “Drew is inspiring not just for his intellectual brilliance and innovation, but also his determination to fight against injustice,” Randolph added.